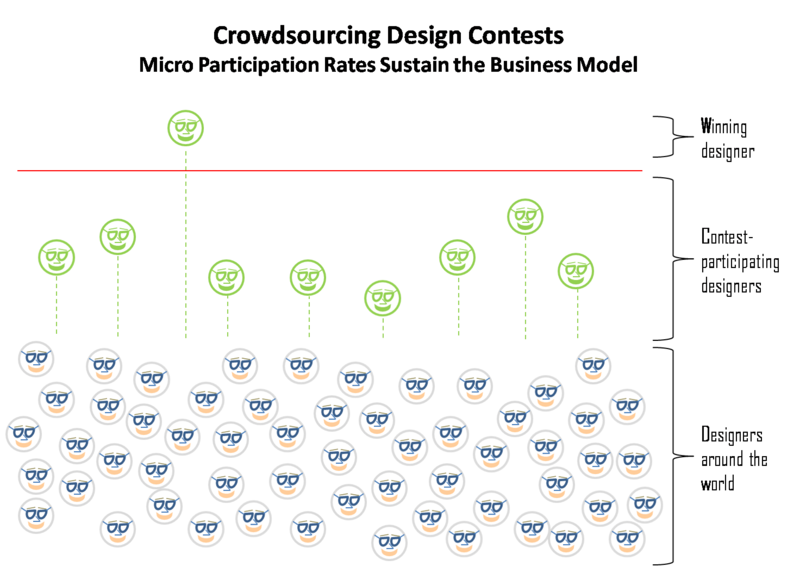 14 Responses to Is Crowdsourcing Disrupting the Design Industry? I think the most important thing to realize here is user experience, this type of work is fairly new on both ends, for clients it’s holding the reins in their own hands, and sometimes that can be a scary thing if you have no experience with going through the logo selection process, which in turn can lead to alot of designs that in the end don’t accomplish the outcome. HOwever there’s also the side of the designer’s user experience, where it’s perhaps more important then the client’s side at first establisihing a strong presence with design crowdsourcing. Also this site spends extensive time in listening to designers through the forums and making changes accordingly on a daily basis to improve the experience for the designer which in turn when improving on happy designers you get better and maore creative work. it’s easy to throw up a site and call it a crowdsourced site for designs but sites like Logo Tournamen that make everyday tweaks are going to be poweful to beat because they ar specifically dong what you mention on leaderboard which is maintain and keep the best possible designers which in turn helps to produce the best possible logos. In my opinion Crowd-sourcing is great for professional designers! Because it takes all the mediocre designers and bad clients out of the way. It keeps the mediocre designers busy from finding good clients and promoting themselves in places that will actually give them good reputation and who wants to work with clients that don’t care or know what their target market needs are or don’t make any research? Also this clients think they know about design and those are the worse! Thank you crow-sourcing and keep all these people busy for as much as you can so professional and great designers don’t have to look as hard for good great clients or jobs! Great overview, Hutch. The devaluation of the design industry is something that affects my line of, and the past few years have been a journey in ways to adapt to the changing reality of graphic design. Moncho Vieira is onto it: what I’ve learned in the past few years is that crowd-sourcing and spec work segments the industry between those who are not all that great and those who are looking for something special and unique. A good client looking for some outstanding work can identify a good designer any day of the week. Designers have to learn to adapt: the veil of mysteriousness behind graphic design has been lifted. If they don’t want to be considered a commodity, they need to offer more than just a logo or a design: they need to be able to sell prospective clients on what makes them unique. It’s really no different than other mature industries. thanks for for the write up Hutch. models like 99 designs are making it harder for a growing number of designers to sustain their project pipeline. The relatively “cheap” work that is available in their community is diluting the design profession, as you mentioned under the beefs section. This is effecting legitimate artists as well as the chump who thinks they can design cause they downloaded Adobe Creative suite. This is debatable. 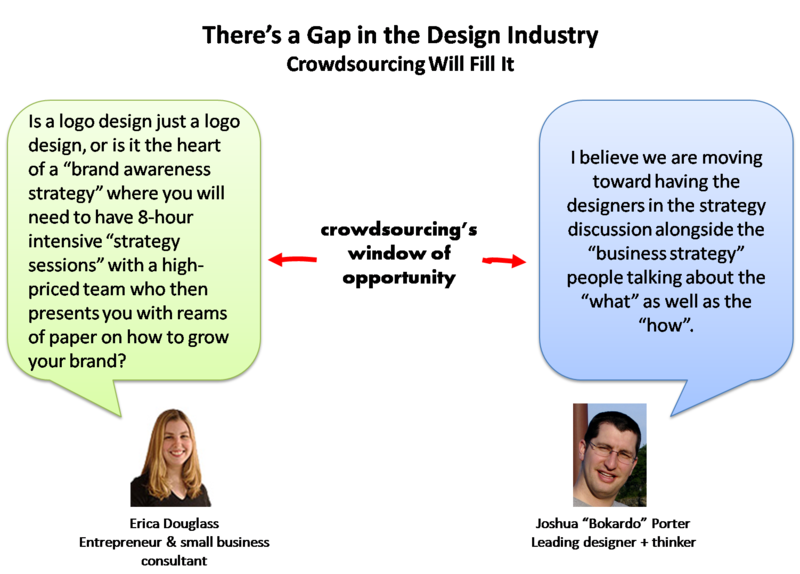 If crowdsourcing is destroying the design industry then, it is also opening up new doors for newbies. Let us not forget that pros were once newbies and many pros are hidden inside newbies of today. Today’s newbies can get a chance to show their talents through the platform of graphic design websites. Also companies who can’t hire pro designers to get their logo designed due to shortage of funds can go to crowdsourcing websites and get at least some kind of professional design if not fully. So crowdsourcing is also creating new markets that would not otherwise have existed. There are good things and bad things about everything in life. So the debate continues…. I understand doing work on spec. It can be a powerful sales tool when used appropriately. “Appropriately,” however, is the operative word here. Some may say this issue is one of supply and demand. I think it is more exploitive, though, given that these sites are making money from the very process that is driving the demand and forcing down the prices. I have mixed feelings about those that allow themselves to be exploited in this way. Perhaps educating aspiring designers better about the value of their work and how to promote that value to prospective clients will help them see the error of these ways. On the other hand, if a business and/or a designer is willing to exploit/be exploited, then that is their choice. I am late to this debate as it has just been brought to my attention. However, firstly thank you for the excellent article, very well articulated and posing both sides of the arguement. The debate is raging here in the UK as well – and the upsides and downside supporters have identical views as those quoted in the article and in these comments. A UK response that seeks to at least make an attempt at addressing the issue without spoiling the fun for everyone is the launch of Creative Barcode (www.creativebarcode.com). It enables designers and other creatives as well as strategists to create data encoded barcodes to protect their work whether those works are their own creations to be negotiated for license to industry, co-creation partners or investors or whether those works are in response to traditional fees for services pitches; crowd-sourcing, and other open innovation activities. It at least establishes ownership and an inherent value in such work which may not be utilised by any other party without the persmission of the Originator. The use of Creative Barcode established ‘an agreement’ between the two parties. Creative Barcode is only for use by professional creative industries to support fair and ethical trading between them and those who seek to engage with them. Crwod sourcing has some merits, I personally do not feel it is appropriate in business to business problem solving activities, where they are akin to ‘free-pitching’ and where submissions are vulnerable to misappropriation. Neither do I feel it is appropriate to negative impact on the productivity of an entire business sector so blatantly in a free for all. New models emerging that are managed professionally, fairly and equitably would be far more welcomed. Those that simply drive down the price to a zero commodity lumping all designers regardless of experience, abilities, investment in talents and education into a exploitable crowd for the commercial benefit of those earning significant profit off of the back of the creative industries – are not at all welcome. There needs to be new rules of engagement. I buy the opportunity for new talent to cut their teeth, or employees moonlighting after hours or simply enjoying the freedom of creative muscle flex without client pleasing. However, unless rules of engagement are transparent and reasons for participation and using crowd sourcing established, it will lead to the design profession being entirely de-valued. And I am sure that even the moonlighters and newbies would welcome crowd sourcing usage guidelines, recognistion and more equitable remuneration terms. Personally, the current status quo is more exploitative than it is rewarding. It does not have to remain that way but until it is, those using crowd sourcing don’t actually know what they are missing. Personally, I am quite on the fence regarding the use of a crowdsourcing site for a logo design. It is still a touchy issue for most designers who said that crowdsourcing is a no-no for obtaining a logo design. I have tried crowdsourcing before and I know the risks involved but it comes within the territory. But there are other no-frills logo design websites online such as http://www.logobee.com, http://www.logodesignstation.com, logoyes.com, etc. which are actually great in getting a professional logo design at a fraction of the price and minus the risks of crowdsourcing (plagiarism is one of them). Seeing that there are no consultation services, the price is significantly lower than that of conventional design firms. 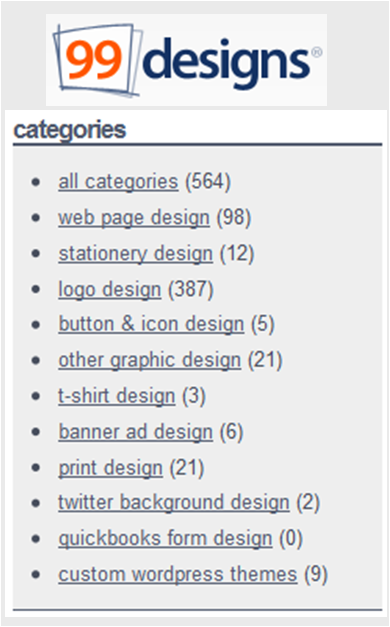 For instance, I have tried http://www.logodesignstation.com and the experience was indeed a positive one. I managed to get my business logo design at an affordable price and the turnaround time was great as well. Highly recommended. Although crowdsourcing for logo designs could be a bane for some, many find it to be a viable alternative to get a fast logo on the cheap. It all depends on the individual actually.